heart disease | What's Green with Betsy?!? I recently watched two award-winning documentaries – “Merchants of Doubt” and “Sugar Coated”. Both films point out how the same PR tactics used by the tobacco industry to mislead the public about the dangers of smoking are also used to create doubt about the reality of climate change and to hide the studies showing the dangerous effect of sugar. In “Merchants of Doubt”, the film uses a professional magician’s methods of distracting the audience to create illusion as an analogy to what some scientists and others are doing to distract us from the reality of climate change and thereby forestall governmental action. 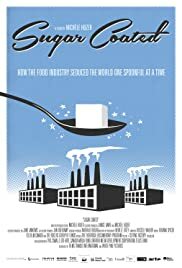 “Sugar Coated” focuses on the obesity, diabetes and heart disease rates that have skyrocketed as the amount of sugar consumed has also skyrocketed over the past few decades. For the first time doctors are seeing children suffer from fatty liver disease. The sugar industry was able to deflect the negative health claims about sugar in the 1970’s, but it is doubtful they will be able to do it again. Both films are extremely well done and alarming in their exposes. Why are these truths hidden? One reason is greed. For the sake of our health, for the health of our children and future generations, and to keep our planet a place where humans can live and thrive, we must look at these issues realistically. On one of these long winter nights, settle down and watch these documentaries. Then act – keep leading a greener lifestyle, cut back on sugar and spread the word! I like the idea of New Year’s intentions as opposed to resolutions. The dictionary definition of a resolution is “a firm decision to do or not to do something” and an intention is “a thing intended; an aim or plan”. An intention seems gentler and more doable. You aim to get there. Reduce greenhouse gases – According to Assya Barrette of mindbodygreen.com, “Animal agriculture is estimated to produce more greenhouse gases than the whole of the transportation industry combined.” Methane gas is the second most prevalent greenhouse gas emitted in the US and cows and other grazing animals emit lots of methane. Help save the Amazon, the Earth’s lungs – The Amazon is being deforested at an alarming rate, the majority of which is for animal agriculture. Another benefit? Your grocery bill will definitely drop. Beef and chicken are expensive; beans and legumes are much cheaper! And there are lots of delicious and creative plant-based recipes on line, which even the most ardent meat eaters will enjoy! Addiction to processed or refined foods and high fat animal products is real, but can be reversed like any habit after a period of time. An intention to eat less meat and more plant-based meals will have a huge impact on climate change and your health. Remember, what’s good for you is good for the earth, and what’s good for the earth is good for you. What intentions have you set for 2016? Happy New Year! Information compiled from: “Why 2016 Is Your Year To Go Plant-Based”, Tracie Hines, “11 Great Reasons To Eat Less Meat (Even If You’re Not Ready To Go Vegan”, Assya Barrette, http://animals.howstuffworks.com/, www3.epa.gov. Nutrient-Dense Chocolate For Valentine’s Day! This Valentine’s Day, indulge in a bit of nutrient-dense chocolate. Hailed as a super food as scientists begin to identify all the benefits of the cacao bean, it’s loaded with minerals, vitamins and antioxidants that can help ward off many common lifestyle diseases. 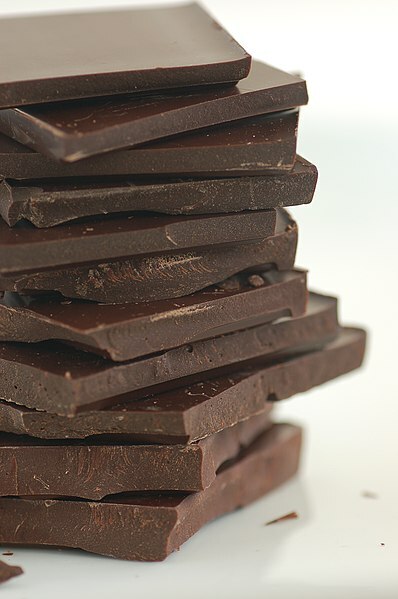 The key is consuming the right chocolate – raw, unprocessed cacoa beans or nibs, or at least 70% cocoa dark chocolate. Not your typical candy bar loaded with fat, sugar and other fillers! Preventing cognitive decline – Scientists at Harvard Medical School suggest that drinking two cups of hot chocolate “can help preserve blood flow in working areas of the brain”. Compounds in chocolate may reduce or block damage to nerve pathways in the brain. On Valentine’s Day, promote well-being and buy your loved ones some healthy chocolates! And, when you next crave a cup of steaming hot chocolate on a snowy day or a piece of chocolate to boost your mood, go for it. Your body knows what it needs. Just make sure it’s a moderate amount of the right kind. Moderate amount? That’s not always easy for chocoholics like me! Watch this short video on the amazing benefits of eating a little chocolate everyday! GARLIC – SO MUCH MORE THAN FLAVORING! I can’t imagine preparing a meal without garlic! But garlic is so much more than a flavor enhancement! Just as some foods can harm our health, others have the ability to heal and garlic is one of those foods. Garlic’s healthful and healing properties are numerous and go back thousands of years. It has anti-bacterial, anti-fungal, anti-viral and anti-parasitic properties, which make it a powerful remedy for colds and flu. It also eases ear infections and may relieve asthma symptoms. It is an effective, broad-spectrum antibiotic, which can heal infections. In World War II, garlic earned the nickname “Russian Penicillin” because it was used when the Russian soldiers ran out of penicillin for their wounds. Research has shown that garlic can boost the immune system and help prevent some of the conditions associated with aging. It has also been shown to lower cholesterol and thin the blood, which may prevent high blood pressure, heart disease and stroke. And there is increasing evidence that garlic may reduce the risk for and treat certain cancers. It doesn’t matter how you consume garlic to benefit from its healthful properties – raw, cooked or as a supplement (good for massive doses or if you don’t like the odor). When my children were sick with a cold or flu, I cut slivers and put them between apple slices for them to eat. They didn’t like it, but it definitely lessened the severity of their sickness. Make sure you cut garlic finely to release the protective compound allicin and cook only lightly so that beneficial compounds aren’t destroyed. Garlic is abundant this time of year – I’ve found some wonderful, pungent new varieties at the Farmer’s market. 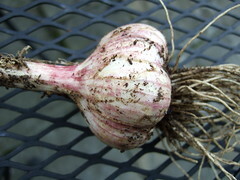 September is the time of year to plant garlic for harvesting next summer. It’s easy to do – simply put several cloves in your garden and wait. You’ll be nicely surprised! Add lots of garlic to your diet for a healthier you! Information compiled from The Doctor’s Book of Food Remedies and The Healing Home by Gina Lazenby. This soup is a great preventative if you feel a cold or flu coming on, but also works if you already have an infection. It tastes good too! In a large saucepan, heat the oil over medium heat. Add the garlic and cook, stirring for 1 to 2 minutes, or until softened. Add the chicken broth and parsley, and bring to a boil. Lower the heat and simmer for 15 to 20 minutes. Drink a cup of soup every hour.